They can represent the future for the realization of coherent circuits with minimal dissipation and nanodevices including analog-to-digital converters and topologically protected quantum bits. In the following, I introduce the topic I have been experimentally involved in. Transport properties of graphene need a deep understanding and extensive investigations with the aim of assessing the real potential of this novel material for future nanoelectronics. Furthermore, fundamental studies of electron-electron interaction effects in two spatial dimensions can be carried on in experimentally feasible systems. Our studies in this area of research are centered on quantum transport in graphene-based double-layer nanostructures (see figure below). 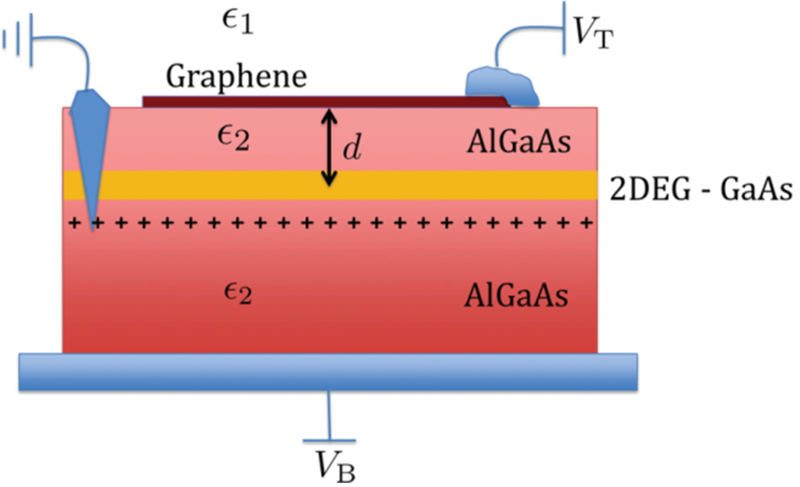 The typical system is represented by a novel hybrid vertical heterostructure for transport studies of inter-layer excitons, which is comprised of an exfoliated graphene sheet deposited on the surface of a GaAs quantum-well heterostructure hosting a shallow 2-dimensional electron gas. The architecture of the devices we have constructed (see figure below) presents several advantages over GaAs 2DEG-2DEG and graphene-graphene bilayer systems. Our double-layer Dirac-Schroedinger hybrid electron system is studied for its capability to display interesting correlated states (and associated transport anomalies) induced by interlayer interactions deep in the quantum Hall regime. Coulomb-drag transport measurements are currently under investigation and can open to new insights on the effects of electron-massless dirac Fermion interaction. The electronic fluids in the two subsystems, the graphene sheet and GaAs quantum well, are independently contacted, so that they electrically isolated. Inter-layer tunnelling is found to be negligible due to the thick Al-GaAs barrier in between. Electrons roaming in the GaAs quantum well are therefore coupled to graphene carriers and viceversa only by virtue of Coulomb interactions, which are long-range in nature. Part of the work in this area of research has been done in collaboration with A.C. Ferrari (University of Cambridge, UK) and F. Koppens (ICFO, Spain).